Small Business Coaching - The Secret To Convert Time To Money. I worked on many tasks. And I was on fire. It happens everyday in business. I worked first on tasks that gave me the most joy. But I didn’t spend time to think if they also made me money. Immersing myself in them made me forget time. I got great results when I spent time on the work I loved. That’s when I stumbled into the secret. It’s the best-kept secret. It helps convert time to money. It brings major value to small business owners quickly. I call it “The Apprenticeship Plan”. The answer: An apprentice is someone who learns from the expert of a trade or skill. See picture above. Remember the time you were a kid. Perhaps, your dad taught you to ride a bike. It was your first time. You were the apprentice then. Your father was the expert. As a successful business owner, you are the expert in managing your business. I mean expert in the tasks in your business. So how does a business owner carry out an Apprenticeship Plan? Make a list of all tasks each hour of the day in your business. Next mark the tasks that are creating revenues. Third, check tasks that you enjoy, which also make the most money. Now you’re ready to develop your team to take over tasks from you. I mean the tasks that don’t make money but are necessary for business. Prepare an organization chart, if you don’t already have one. It will show the reporting layout. Then list your tasks on it––as the business owner. Group your tasks by its fun and moneymaking value. Now, you choose the ones, which are fun and also make money. Rest is ready for transfer. See who is most suitable for the remaining tasks. Then assign each task to the right person. That person takes the role of “apprentice”. Our coaching will take you and your apprentice through 4 stages of skill transfer. In the final stage, the apprentice does the task. You’ll watch him or her do it. Follow these steps. 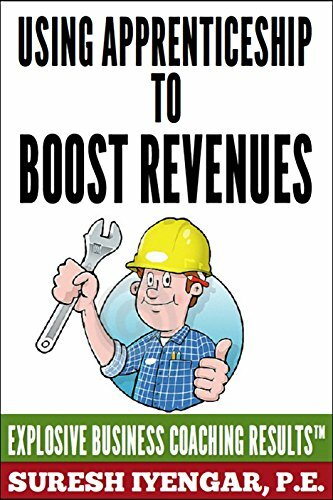 And you will discover the secret to boosting your business revenues. And now you can do it much easier than before. Written by Suresh Iyengar, P.E., President, Business Unit Execution LLC––“Explosive Business Coaching Houston Results For Small Business”. Want faster results? Are you ready to learn? Call 281.410.5375 and speak to your Profitability Coach Houston today!